The Schafer Trust Fund was established in 1993 by Sheila Schafer a long time supporter of junior golf. 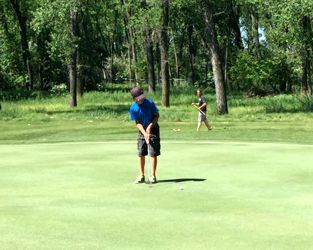 The fund currently has a balance of over $50,000 and the yearly income that it provides helps Dakota Junior Golf maintain its high level of service both in lessons and tournament play for our young golfers. Sheila's love of the game of golf goes back some 40 years, when she took her first lesson from Tom O'Leary. Since that lesson she has went on to win seven women's club championships at Apple Creek Country Club between 1959 and 1974. These days she's an avid golfer only "when we go away in the winter, then I play three times or more a week. In the summer I don't play much at all because I'm committed to Medora". "I've always been interested in young people learning to golf, we have made Dakota Junior Golf one of our favorite charities".